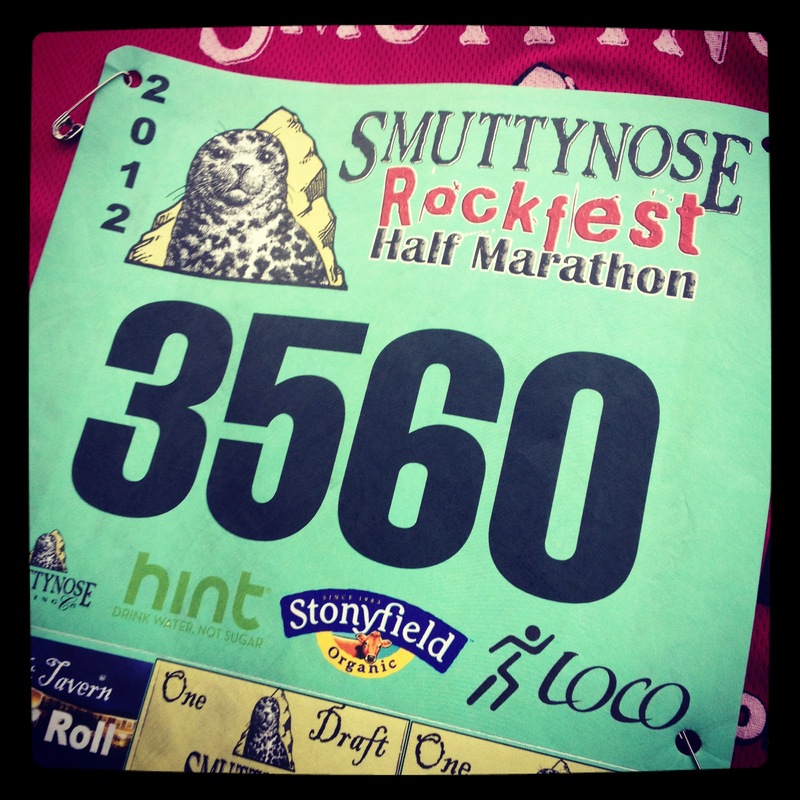 Hampton Rockfest Half Marathon race recap | Fit Girl. Happy Girl. After months of training, the race day finally came last Sunday and I ran my very first half marathon. I feel like I have so, so much to share about the experience of running this half that it frankly will not fit into one post. Therefore, I’m going to break it up into two- a race recap (this one!) and then a lessons learned reflection. For those of you who have been following my running escapades over the last eight-ish months, you know where I started- a couch to 5k program last March. Before starting this program, I could barely run a mile and the only running I ever did was for sports in high school. But for some reason, I decided I needed to start, so I started slowly. Before I knew it I was running more than 3.1 miles and my cousin, Paige, convinced me in June to register for a half marathon with her- the Hampton Rockfest Half Marathon. At this point, the most I had ever run was just under 6 miles, but we were both convinced we’d have plenty of time to train in the four months before the half. Turns out we had plenty of time and before we knew it we were running even more than 13.1 miles on our weekend long runs! All of our hard work and dedicated training finally came to fruition this past Sunday when we crossed the finish line on Hampton Beach. We planned out our weekend accordingly. Because we would have to travel to New Hampshire for the race, I stayed over Paige’s apartment on the North Shore (of Massachusetts) with our friend Lindsey, who was also running with us. This would be the first half for Paige and myself but Lindsey had run a few before. Once we were all settled in at Paige’s we decided to head up to NH to pick up our bib numbers so we wouldn’t have to deal with picking them up before the race. Turns out, that was a great decision and the packet pickup was also super easy. My lovely number after the packet pickup. We came home after and made a delish baked ziti, drank one glass of red wine each to calm the nerves and watched a few episodes of some trashy reality television before heading to bed at 10:30 p.m. Of course, I had a hard time falling asleep because I was thinking about what was about to go down the next day but eventually I fell asleep and woke up to my alarm blaring at 5 a.m. After making our breakfast and fueling up on coffee, we headed out of the house by 6 a.m. to get to the race with enough time to spare. We arrived at the race around 7:15 and spent most of the time before the race waiting in line for the port-a-potty. When we were all set and warmed up, we headed to the start line. I couldn’t believe how many runners there were (more than 5,000!) and the start line was a little claustrophobic because of it, but the mass of bodies helped to keep us warm. 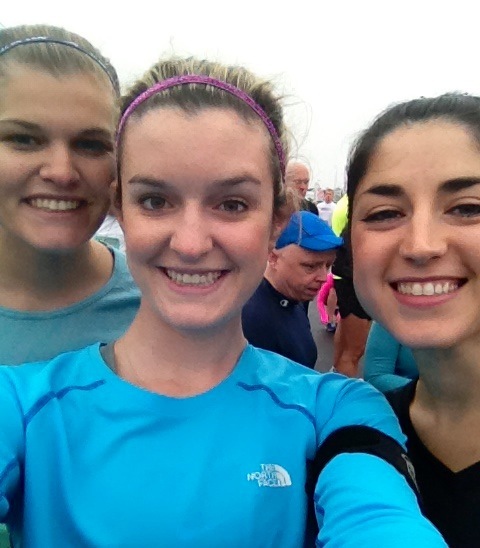 Awkward pre-race selfie at the start line. That was the other problem. I think we may have had the WORST weather ever with temperatures in the low 50s and a steady, cold rain falling the entire time. Needless to say, after I crossed the finish line and stopped moving I was a frozen popsicle. The race itself was pretty amazing and the course was pretty easy. It started off with a roughly 1-mile loop around the corner which crossed back over the start line. This was great because we were able to run through the crowd of spectators for a second time. The course then traveled down the beach road for about 2 miles before it cut off into the neighborhoods of Hampton, NH. This was kind of weird because we were literally running through residential neighborhoods and for awhile there were hardly any spectators which was not fun. However, because there were so many runners, the morale along the course was really high and we were even able to talk to a bunch of other runners along the route. We had decided at mile 7 we would pick up our first cups of water and take our gels. This proved to be a little more difficult than we had anticipated because the water station was so crowded and some runners kept stopping before we could get to the water. Water in hand, we took off, ripping our gels open and refueling. After taking the gels I definitely had some fresh energy and felt great. However, some point right after mile 7 I got lost in the pack and Paige and Lindsey went on ahead. This was ok for me though because I knew they were going to speed off eventually (they are a lot faster than me) but I felt good at my pace and wanted to maintain it. The last few miles went pretty smoothly. The course was extremely flat except for a moderately steep hill around mile 9, but once I got to the top of the hill I had a breathtaking view of the ocean and could almost make out the finish line down on the beach. I felt really good at this point but had to take it easy going down the hill because the pavement had gotten SO slippery because of the rain. As I crossed into mile 11 I heard someone screaming my name and saw my parents jumping up and down on the side of the road. I knew they were going to be there but I wasn’t sure where they would be along the route because it wasn’t super well-routed for spectators. It was incredible to see them though and it gave me the extra encouragement I needed to blast to the finish line. With two miles left, my legs were started to feel crampy and heavy, mostly because of the cold. My hands were also freezing so I kept having to shake them to try to keep them warm. But overall, the last two miles were fantastic. With about a half mile left, the spectator crowd got thicker and I saw my parents again screaming my name. As I pushed hard to get across the finish line and pass a few more people I started to get emotional because I honestly could not believe I had done it! I crossed the finish line at 2:18:09 (not my best but the weather definitely took a toll) and someone placed a medal around my neck and I was ecstatic! After finding my parents, I was walking around to find water and I heard two people call out my name and all of a sudden I was embraced by my two best friends Sydney and Angela! They had come all the way up to NH from Boston to see me cross the finish line. I’m getting emotional now as I write this because I was just so happy that they had come out to see me. They’ve been with me this whole time and have even wondered if I was going a little overboard with running but have been supportive no matter what. It meant so much to me that they were there. 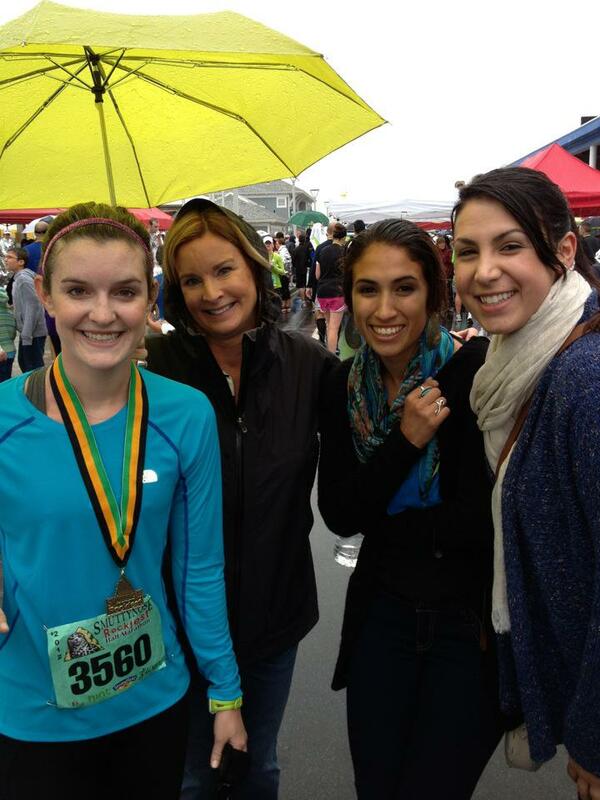 At the finish line with my mom, and two best friends, Angela and Sydney! Unfortunately because it was so cold and Paige, Lindsey and I were soaking wet, we didn’t want to stay around too much for the race after-party so we decided to all go out to lunch somewhere warm. I’ll talk more about the lessons learned in another post but overall the half was an amazing experience and the first thought I had after crossing the finish line: I can’t wait to do it again! Great recap! 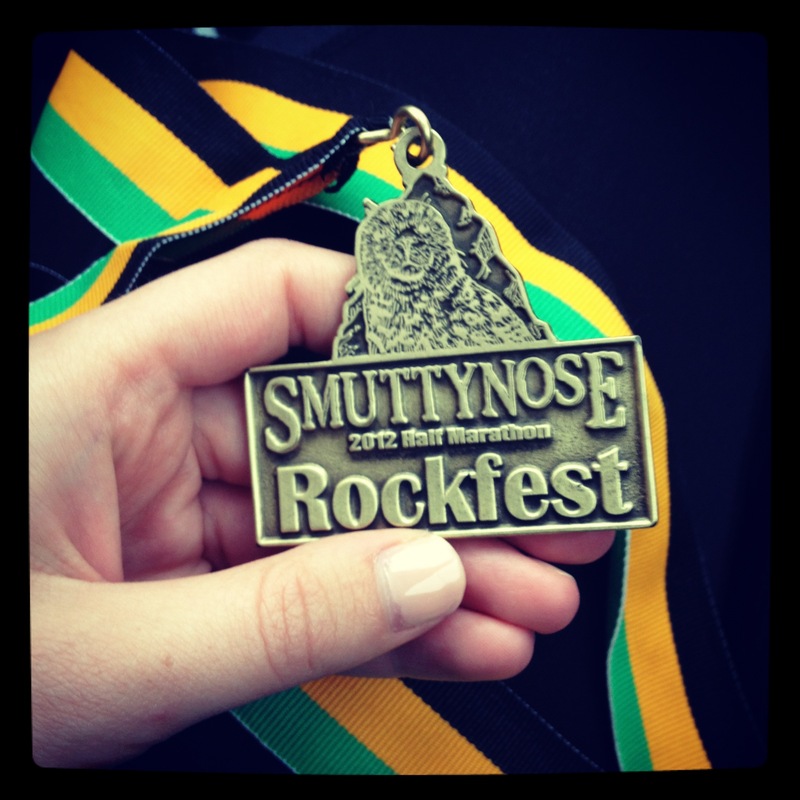 I love the medal, and the smuttynose races are always so fun! (I run the 5k in June). Awesome job! Thank you! I was actually supposed to run the 5K in June as well but had to cover an event for work. Congrats on your first Half. I’ve heard that this is a good one and I plan to run it some day. There’s nothing better than having friends and family at a race to cheer you on. I’ve run parts of this course for other halfs. I think Half at the Hamptons is in the same area. Beautiful houses, and I think most are “summer cottages”. Love the medal, and I bet you do to. Pretty exciting stuff, eh? Thank you! It was incredibly exciting which is why I can’t wait to do another one. I thought the course was really good because it was so flat the majority of the time. I wish it had been less crowded though because it was hard to get around people at some points. Great job and congratulations! What a special feeling and so wonderful your friends were there to support you! Thank you! It was really amazing to have them there, made the whole day that much better! Thanks lady! I wish I ran faster but the first time is a whole world of the unknown. I cannot WAIT to sign up for another though!! Congrats! I haven’t done this one, but it’s now on my Bucket List! Other than the weather, it looks like a fun easy race! Yes! I would recommend it. I mean weather is always unpredictable but the race course itself is really great and flat. Congratulations! I just recently finished my first sprint triathlon and am very familiar with all these feelings. Great job. Thank you and congrats to you!! I’ve been thinking about doing a sprint triathlon too! Sounds like a blast. It was fantastic. If you want to do it, just sign up and do it. I signed up for mine spur of the moment and I am so happy I did. Congrats on the race. Love the new bling! Pingback: Registered for my second half marathon! | Fit Girl. Happy Girl.